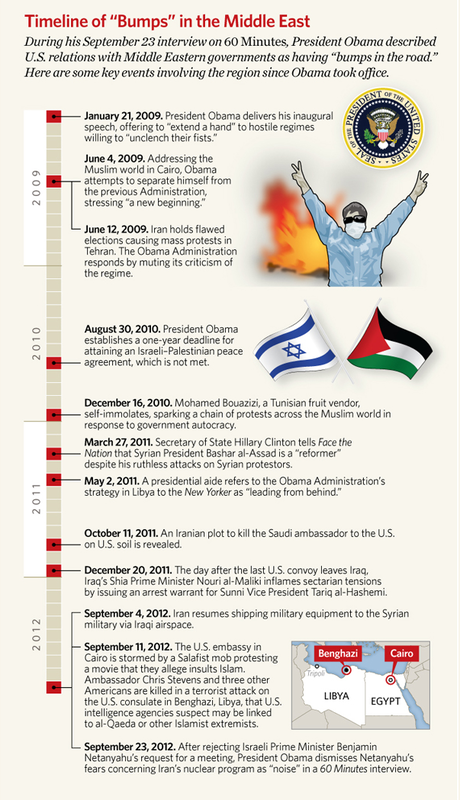 The recent attacks of 11 September 2012 has brought into extreme focus the Obama Administration’s Middle East policy of apology and appeasement. The fact that President Obama can not admit that he might possibly be wrong is just too much for him to admit.Even in the face of evidence piling up to the sky he will not level with the American people. Because to do so will be another arrow in the Romney Campaign’s quiver to be pulled out to shoot before the 6 November 2012 election. Sadly if allowed to continue, more Americans may lose their lives because of these policies. Worse yet, the whole Middle East can erupt into all out war and then all the cataclysmic scenarios will be played out for all to watch in horror. And all because one man can not admit he might be wrong. Just bumps in the road to the White House 2012. Do you know of this Freedom for America group? My son handed me the phone and after chatting with this chick, she hung up on me. Is this how polls are done? Reckon the yellow-brick road to the WH may be slicker than what Dorothy was bettin on, huh? No, angel baby; it’s called Simon Says. What if Obama is an alien? Conjecture is fun, but you take it way too seriously, and then tend to forget that it was conjecture in the 1st place. Um, I kinda have a crush on your dog. I hope that dosn’t freak you out totally 100%. There have been no apologies and there has been no appeasement. I wonder how Ambassador Chris Stevens’ family and the families of the other 3 Americans killeded in Libya feel about the murders of their family members being called “bumps in the road” by OWEbozo?